Is it time you undertook a little home improvement? Compare some of the best hardware store brands to get started on your dream DIY project. 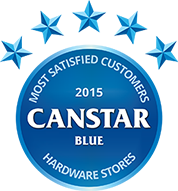 Canstar Blue research finalised in January 2015, published in February 2015. Bunnings received five star ratings for overall satisfaction, value for money, range of brands, range of products and store layout. Men are more than twice as likely as women to have been injured while undertaking a DIY project at home (19% versus 9%), despite the fact that they’re only marginally more likely to start these projects in the first place (53% versus 42%); according to the Aussie hardware store customers we recently surveyed. The root cause of these safety woes? It could be that 19% of men admit they often take risks when doing DIY at home, while only 13% of women could say the same. Most Australians are pretty sensible though, with roughly 4 in 5 taking the appropriate safety precautions when doing DIY at home. Half of respondents even go the extra mile and turn to their local hardware store for advice – just to make sure they do things correctly. And who better than the experts to help you with these problems! Hardware store staff are quite knowledgeable in the area of DIY, and many retailers offer classes to help you improve your skills. The bigger question looms: which hardware store is best for you? In these results, we found that customers were most satisfied shopping at Bunnings Warehouse for their hardware supplies. This brand has secured our award in 2015 ahead of Masters Home Improvement, Home Timer & Hardware, and Mitre 10. This is the second year running that Bunnings have taken home this award. Several other brands were not far behind our award winner, earning five star ratings of their own. Let’s take a look at some of the standout brands in this survey. Bunnings received five star ratings for overall satisfaction, value for money, range of brands, range of products, and store layout. Masters tallied five star ratings for value for money and the layout of its stores. Check out the full results above. Canstar Blue commissions Colmar Brunton to regularly survey 3,000 Australian consumers across a range of categories to measure and track customer satisfaction. The outcomes reported are the results from customers within the survey group who have made a purchase from a hardware store in the last 12 months – in this case, 2,460 Australians.